It does not come as a surprise: Your organization is only as good as your employees. And your employees are only as good as your talent acquisition (aka recruiting) and talent management philosophy, approach, and team. We all agree, don´t we? However, ask yourself, how is your employer handling recruiting in reality? In other words: Are people and talent in your organization at the heart of its mission and strategy or just another cost line in the P&L? Are they as important as the organization´s clients, customers, and objectives? Is senior management doing whatever it takes to recruit exceptional talent to continue building a successful organization? Fact is, that many companies don´t know how to identify, target, and recruit the talent who is interested in meaningful career moves and which might fit with vacant positions you´re looking for to fill. One key reason being that people in this group are largely passive candidates who need to be contacted at the right point of time with the right message to stimulate them to respond at all. Find out in this article which trends will shape the future of talent acquisition. Learn how you and your company can locate, recruit, and retain the right candidates better and faster. And how to rock recruiting and your organization in the future to stay successful. Applying A Strategic Mindset: A top-notch recruiting department establishes itself as a reliant, thought-provoking, equal, and challenging partner of the business and senior management alike. Not only filling vacancies in an transactional manner, but equally important advising business partners on long-term company and employee requirements and strategies. Based on thorough analyses, hard data, and holistic forecasting. Therefore recruiting needs to be perceived by all leaders and managers of the organization as a key function which is owned by everyone; and not only by the recruiters. Embracing A Marketing Attitude: Marketing departments, more than any other function of the company, have already undergone dramatic change processes with break-neck speed in order to beef up and better understand and serve external customers. In consequence, there is a lot recruiting teams can learn by thinking and acting more like marketers. Talent As Customers: Organizations should approach talent acquisition in the same sophisticated and dedicated manner as when trying to acquire new customers. Worded differently: "With a high probability there is some sort of customer lifecycle management process installed in your organization. The resulting million dollar question: Is there also a talent lifecycle management system in place?" Let´s face it, there are still (too) many companies who have not really understood that employees are their internal customers. Consequence: "You can´t satisfy and excite your external customers with great products and services, if your internal customers are not motivated, well looked after, and engaged." Simplification Of Tech Interaction: Job applicants should experience a state-of-the art application experience which is as good as the organization´s customer experience process. Have you ever thought about e.g. having a highly skilled team in place answering questions of people who think about working for you? Maybe via web video or web chat to keep it scalable? Do you have dedicated metrics and a comprehensive reporting set up to monitor and review the satisfaction levels of your applicants for each step of the interview process? Strong Employer Brand: Every organization should not only nourish its consumer brand, but also create an attractive employer brand. Key branding principles would need to be applied to the employee experience. For example, a best possible design of a company´s site is of a paramount importance, since there it is where often the job hunting begins. In this respect it´s crucial having a well-designed career site which transports a consistent brand image that reflects the company´s main values. This enables job seekers to define if they might be a cultural fit and if it could make sense to apply. As such companies are well advised taking some time to look at how they're being reviewed on sites like Glassdoor, Great Place To Work, Vault, etc. Possibly they can incorporate the reviews and learning into their website or any other form of (talent) communication. The Ultra-Fast Rise Of Technology: Artificial Intelligence (AI) will play a key role in assisting recruiting. I expect that already in some years it´ll be used to help screening candidates resumes based on pre-defined traits, skills, and clues on required management and leadership principles which then will be matched with suitable vacant roles. AI will support recruiters also to assess a candidate´s abilities and behavior (e.g. coping with pressure or working in a team) in real-world scenarios (e.g. with the help of special apps running on computers and mobile devices). It also looks like that the phone call as preferred first-round recruiting means will be soon replaced by live, two-way webcam interviews. Big Data Powers On: New recruiting screening tools, powered by big data systems, will survey social sites such as Linkedin, Xing or Viadeo (e.g. profile changes, articles published, sudden increase of new contacts, etc.). Top companies will rather rely on quantitative data versus gut instinct. Sites like Joberate already scrape publicly available data from millions of individual online social media accounts and assign a score that estimates the level of job search activity. So if e.g. someone starts making many professional connections on Linkedin, publishes multiple questions or comments on Stack Overflow (with more than 6 million members the world´s largest community of programmers) the scores go up and possibly indicates a lower engagement level, i.e. a higher openness for switching jobs and listening to a recruiter calling at exactly that time. Engagement Beats Sourcing: Often the challenge is no longer finding talent, but activating and engaging them. There are several related strategies organizations should consider. One option is to involve hiring managers earlier in the process, i.e. the recruiting team partnering with them throughout every stage of the talent attraction and recruiting cycle. In top organizations this starts already with hiring managers assisting identifying and sourcing top talent (e.g. via their own alumni or personal networks). Another effective strategy in this context is using gamification. Companies could establish e.g. virtual tournaments to search for top talents (like e.g. the digital start-up Umbel is doing it with its gaming challenge called “Umbelmania”). And, of course, social media has become mainstream for recruiting. New platforms like The Muse give job seekers a more intimate view of and broader insights into company culture, values, communication, and opportunities of multiple organizations. Data Analytics: Through biometric data and analytics, companies like NextHire can better predict which candidates are most likely to be a good fit for a position. Applicant tracking systems (ATS) – like e.g. Silkroad or Bullhorn which allow to source, attract, engage, screen and hire top talent fast, become a must for any organization. For an excellent overview of leading ATS check here. Candidate Relationship Management (CRM): A CRM tool does more than tracking candidates like in an ATS. It allows to seamlessly share notes, develop and nurture leads, and document activity across the entire organization. It also can match the company´s internal talent data base with external people aggregator sites such as HiringSolved which gathers data from across the web and filters the most relevant data points and search results. New Hiring Metrics: Traditionally, recruiters have been evaluated almost exclusively on metrics like time to fill or cost per hires. The problem is that focusing too much on the sheer number of butts they can pull through the hiring funnel and into seats ignore important controls regarding quality of hire, candidate engagement or respective recruiter´s overall impact on organizational recruiting or retention. In the future the entire hiring team will be assessed more by the real value their work generates. Employees as Ambassadors: There´s nothing more credible than having employees inter-acting with potential future colleagues. Employees participating at external recruiting events, job fairs, conventions, etc. is a first good step. Having them activating their own social networks and alumni sites is an even more powerful and scalable next step. Think about how best to attract e.g. your company followers on Linkedin, Xing, etc. Post engaging and relevant content on your site and blog and motivate employees to share and comment it. By the way, anyone in your team blogging or podcasting about non-confidential and still work-related topics? You might want to get this one kicked off rather quickly. Influencer Marketing To Recruit: As many companies now use social media to recruit, there’s a mass of online content, tougher competition, and as such it’s harder to differentiate your organization. To cut through the clutter you would need to be in a position to send job seekers clear signals to generate interest and trust. Potential candidates often turn to peers, credible opinion leaders or recognized "voices“ to get information about companies, careers, and job vacancies. Using this technique within recruitment could push you ahead, since the recruiting industry is only about to discover Influencer Marketing. Humanness Beats Tech: Even, and especially in the digital age, organizations need to radiate a strong human touch, emotions, and warmth. An excellent opportunity for companies to give their organization a "face“ by having employees acting as real and authentic ambassadors (e.g. video tours on company main website, etc.). It goes without saying, that the very central task of recruiting is to anticipate and fill vacancies with the right candidates as soon as possible. That´s the fundamental and transactional mission and obligation of recruiters. At the same time, recruiting is changing rapidly. Job boards and job ads will soon become relicts of the past. Big data, sophisticated matching algorithms, CRM tools, and absolute talent-centricity will influence recruitment more than ever. Recruiting will need to become a key function and department of the organization by taking on more strategic tasks such as long-term staff forecasting, planning, and business advising. Always closely embedded within the overall HR strategy and team and in a tight exchange with all main stakeholders and business partners (e.g. legal, benefit and compensation, tax, etc.). Recruitment - like the overall management of employees - must be co-owned and carried out by line managers. Organizations that understand and resolve the challenge of candidate engagement e.g. by having various authentic employees communicating and inter-acting with candidates will ultimately prosper. Last, but not least, the better a company develops, looks after, and retains its existing workforce, the smaller the need (and pressure) to recruit new employees. How can Techmeetups.com help you ? 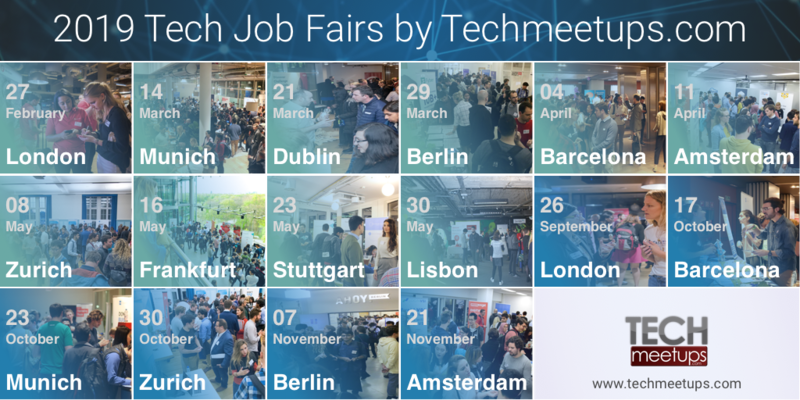 We help Startups through Events like Meetups, Workshops, Hackathons, Job Fairs, Events Promo and also have www.techstartupjobs.com to help you recruit your tech team.